Donald Glover is known to most as the star and co-creator of the hit FX series, “Atlanta” or as the voice of Simba in the upcoming live-action film “Lion King” or for playing a number of supporting characters in “Solo” or “Spiderman: Homecoming”. He is also widely famous as Childish Gambino, his musician persona, famous for creating hits like “Redbone” which even earned him the Grammy Award for Best Traditional R&B Performance in 2017. Consequently, it was no surprise when he was asked to host a Saturday Night Live episode on 5th May. 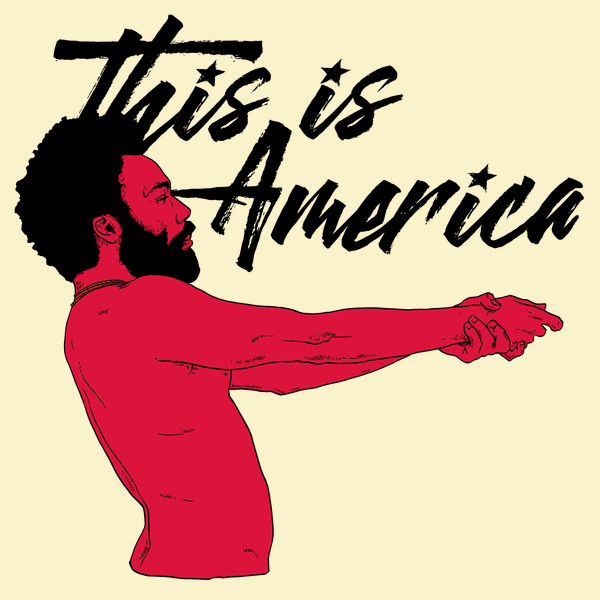 What really made the news was his latest single, “This is America” and its controversial music video which was released on YouTube simultaneously as him performing the song on the show. In a politically charged atmosphere that America has been since Donald Trump’s election in 2016, racism has become more open and explicit, oppression towards African-American people more systematic, things had come to a tipping point where everybody was looking for that one person to speak up. Gambino, with his latest song along with its video, did just that and loudly. The lyrics primarily address being black in the United States (This is America/Don’t catch you slippin’ up) and gun violence in the country, also touching upon police brutality. Pitchfork’s Stephen Kearse rightly described the song as a representation of the “tightrope of being black”, with the song “built on the sharp contrast between jolly, syncretic melodies and menacing trap cadences”. The video is strikingly direct and almost brutal although it is heavily nuanced and aesthetically shot and choreographed. 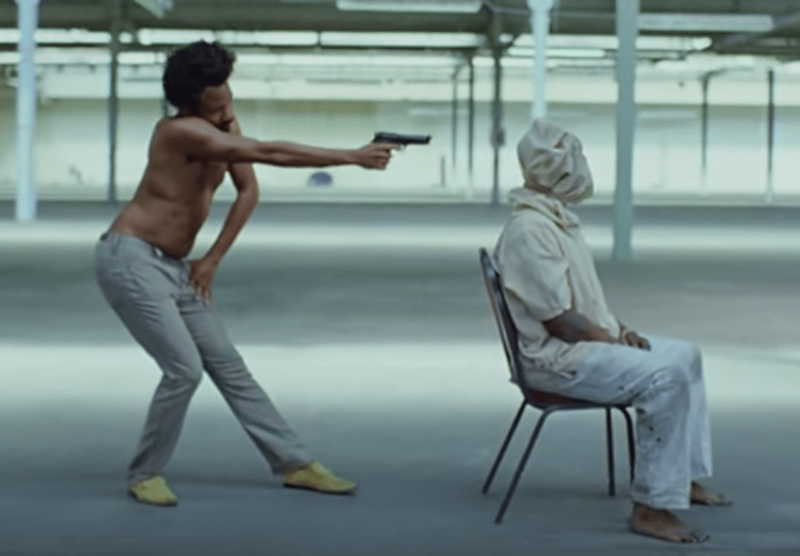 It starts with Gambino dancing with a melodic flow when suddenly he takes out a gun and shoots the black guitar player who did no harm- the body was dragged away, but the gun carefully wrapped hinting at how the National Rifle Association of America cares about its guns more than the dead bodies they cause. The iconic stance that he took before killing the guitar player seemed just like the caricature of Jim Crow, the black theatre persona created by Thomas D. Rice in the 1830s. Jim Crow later became eponymous with the racial segregation laws that surfaced in USA. Gambino also commits a mass shooting in the video after a minute, where he guns down a Church choir, reflecting the Charleston Church shooting in which white supremacist Dylann Roof murdered nine African Americans at the Emanuel African Methodist Episcopal Church. Throughout the video, there is a pattern, Gambino and a group of other black school students keep dancing all the latest dance moves, following all the trends distracting us from the absolute mayhem and chaos happening behind them. 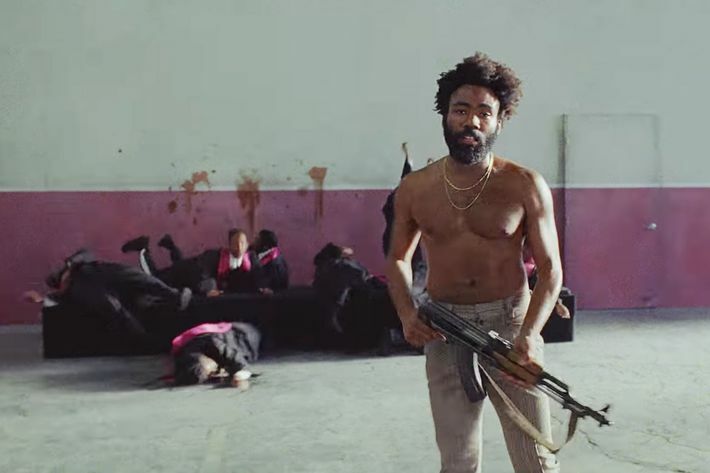 There is murder, there is police brutality, there are chase scenes, but one hardly notices that on their first watch because Gambino’s arresting dance and facial expressions does not allow us to move our eyes. There are shots of young children recording the mayhem on their mobile phones, pointing out the social irony where we take pictures first and call for help later. The ending scene is nothing short of a masterpiece where Gambino is seen running through a dark alleyway chased by a number of white police officers. His chest is bare, he is only wearing pants and in the dark, only his eyes and teeth are visible, his terrified face reminding us of all the movies we have seen about slavery in USA. Those slaves ran from their masters the same way Gambino is running from the police officers, sure of his innocence but still scared for his life. To me, through this music video, Gambino succeeds the moment he makes his audience, irrespective of their origin, nationality and ethnicity; share in the horror and the desperation of what it must be like to be “black” in America.